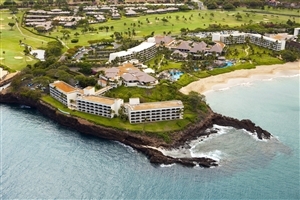 Situated upon the gorgeous sands of Kaanapali Beach, the Sheraton Maui Resort & Spa is a premier holiday escape that serves as an idyllic and intimate place where travellers the world over can gaze out and enjoy some of the best views of the Hawaiian Islands, with the distinct point where the ocean meets the legendary Black Rock of Kaanapali. Perfect for honeymooners, couples and family adventurers, the resort’s numerous soothing and recreational facilities help ease guests into a state of bliss, while the numerous in-house dining venues bring the flavours of the island alive and each of the 508 intricately designed accommodations set the tone for an unforgettable stay thanks to their many comforts and unforgettable Maui views. 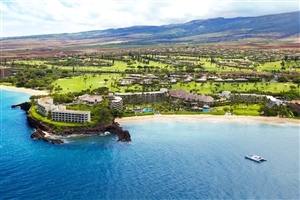 Located along the soft sands of Kaanapali Beach, the Sheraton Maui Resort & Spa serves as a fantastic tropical escape where visitors the world over can see the beauty and splendour that runs rife across the Hawaiian Islands, such as the point where the ocean meets the iconic Black Rock of Kaanapali. 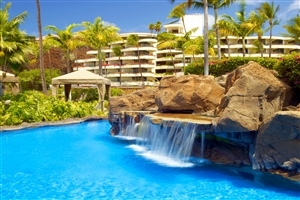 Ideal for family adventurers, romantic couples and honeymooners alike, the resort caters to all tastes and types, boasting plenty of recreational and soothing facilities, a choice of in-house dining venues and 508 lavishly fitted accommodations that all come together to create a Hawaiian oasis that’ll certainly leave a lasting impression. The Ocean Front Room offers guests a stylish accommodation elegantly designed with plush comforts and modern amenities all throughout. The room features views that look towards the Pacific Ocean and the historic Black Rock. This room is located in Hale Anuenue and Hale Nalun. The Ocean View Room offers guests a stylish accommodation elegantly designed with plush comforts and modern amenities all throughout. 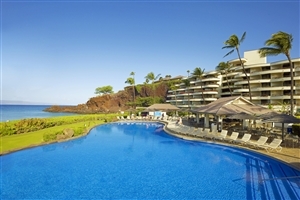 The room features views that look towards the Kaanapali Shoreline and the natural lagoon pool. The Resort View Room offers guests a comfortable accommodation fully fitted with plush amenities that perfectly compliment the modern decor and amenities found all through the setting. 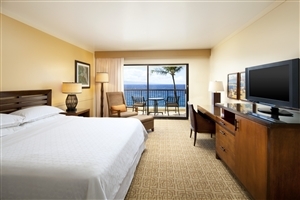 The room features views that look towards the West Maui Mountains and the Kaanapali Golf Course or the resort gardens. This room is located in Hale Anuenue. The Deluxe Ocean Front Room offers guests a lavishly designed accommodation that boasts generous amounts of space, comfort and style. The room features views that look out towards the gorgeous, shimmering ocean front. This room is located in Hale Moana and Hale Hoku. The Deluxe Ocean Room offers guests a lavishly designed accommodation that boasts generous amounts of space, comfort and style. The room features views that look out towards the gorgeous, shimmering ocean. This room is located in Hale Lahaina. The Ohana Suite offers guests a stunningly designed accommodation lavishly designed with quality amenities that come accompanied by plush furnishings, generous amounts of space and stylish decor. The room comes in regular and junior suite format. This room is located in Hale Ohana and Hale Lahaina. The Ocean Suite offers guests a generously spacious accommodation filled to the brim with lavishly comfortable furnishings that are further enhanced by the modern amenities and elegant sense of decor. This room is located in Hale Anuenue, Hale Nalu and Hale Hoku. The Deluxe Ocean Front Suite offers guests a palatial accommodation that comes with numerous commodities spread throughout the setting and additional living space. 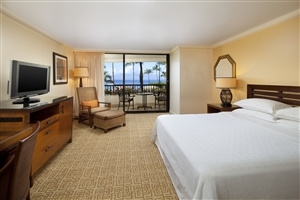 This room is located in Hale Moana, Hale Hoku and Hale Lahaina. The Ali’i Suite offers guests an opulent accommodation beautifully furnished with a host of amenities and complimented by generous amounts of comfort, style and space. The suite features a dining area, a full kitchen, a living room and a patio for an enhanced experience. Black Rock Kitchen – Prepare your palate for some casual dining where island influenced dishes fill the menu of this elegant eatery. Teppan-yaki Don – Taste the sublime dishes produced at this renowned eatery where Eastern flavours meets West. The Cliff Dive Grill – Ease back and enjoy the tropical ambiance, exotic beverages and light bites while watching the cliff dive ceremony. 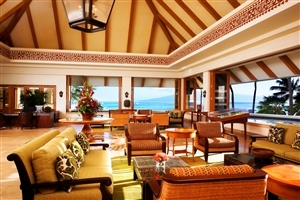 Mai Tai Bar – Enjoy the views from this lounging bar with a refreshing cocktail or satiating the palate with an appetising snack. Black Rock Lounge – Live it up at this late night hotspot where DJ’s, themed nights and lounge evenings are complimented by a variety of beverages. Mau Nui Lau – Enjoy the show as traditional Maui entertainers treat you to a show of music, dance and history while you dine fine on Hawaiian fare.